Note: Your order will be sent in colors at random. ♥Great for home-based strength training. Heavy resistance. ♥Both for men and women. Ideal for travel and storage. ♥It will not recoil and twinge your chest hair as it may sometimes happen with the metal springs. Rubber bands are easily added or removed by snapping on or snapping off action. 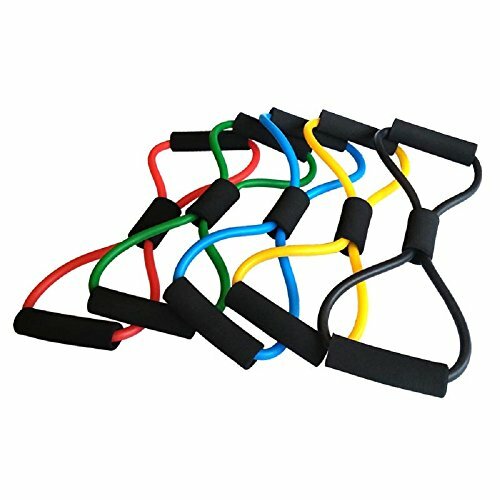 ♥Our figure 8 tubes resistance bands are made of 100% natural latex and come in 3 resistance levels, from light (8-10LB) to medium (13-15LB) to heavy (17-20LB). This makes them perfect whether you are just a beginner or a seasoned workout pro. Soft foam handles provide a comfortable grip. ♥Our closed-loop figure 8 design are a perfect tool set for stretching, muscles toning, yoga, Pilates, weight lifting, home gym, and physical therapy. They are durable, tough, and great for strengthen your legs, arms, glutes, shoulder, and hips with no fear of tearing or snapping. If you have any questions about this product by SANDAO, contact us by completing and submitting the form below. If you are looking for a specif part number, please include it with your message.